Category Archives for "Feature Articles"
Marketing is a very judgmental business. Marketing directors are constantly judging the results of their efforts. Sometimes objectively, sometimes not. Ad agencies and design firms judge each other in a constant battle of “my work’s cooler than your work.” They also subject themselves to judging in award shows, where a few peers get to judge the work of hundreds of competitors on an entirely subjective basis. When it comes to television advertising, everyone’s a critic. TV viewers sit around and judge the advertising they see, based on entertainment value alone. If it’s entertaining enough, they might talk about it over the water cooler. If not, they vote with the remote. Every year at the Mac Expo, Steve Jobs used to unveil some fantastic new, game-changing technology from Apple. His presentations were always outstanding, both for the content and for entertainment value. 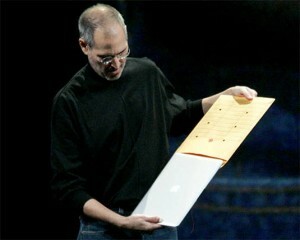 For instance, when he introduced the MacBook air back in 2009, he didn’t just talk about the specs of the new product, he demonstrated its thinness by pulling their tiny new laptop out of a 9×12 manilla envelope. It wasn’t just passion and natural charisma that made Jobs an effective communicator. It was his ability to convey ideas in simple, concise ways. He used honest demonstrations. Stories. Theater. And yes, some Hollywood special effects. Not Powerpoint.